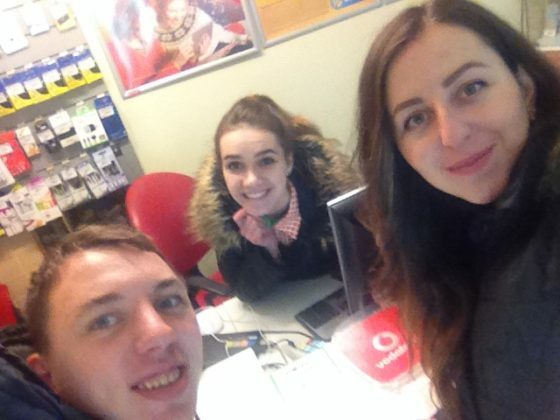 Our next staff interview is with Lena Voznyuk, again with thanks to Yulia Nesterenko for Skype translation and commentary. Heavily edited for brevity and clarity. LB: How did you first learn about Last Bell? 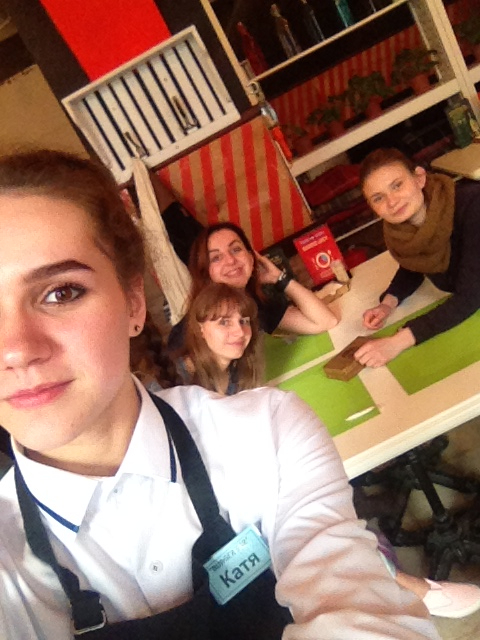 Lena: When I was a girl, ten years old, I was Katya Dubenko’s neighbor. I noticed that Katya, a little girl two or three years old, was on the street all the time, not with her mom. My parents called social services… they found Katya’s mom; she was an alcoholic. 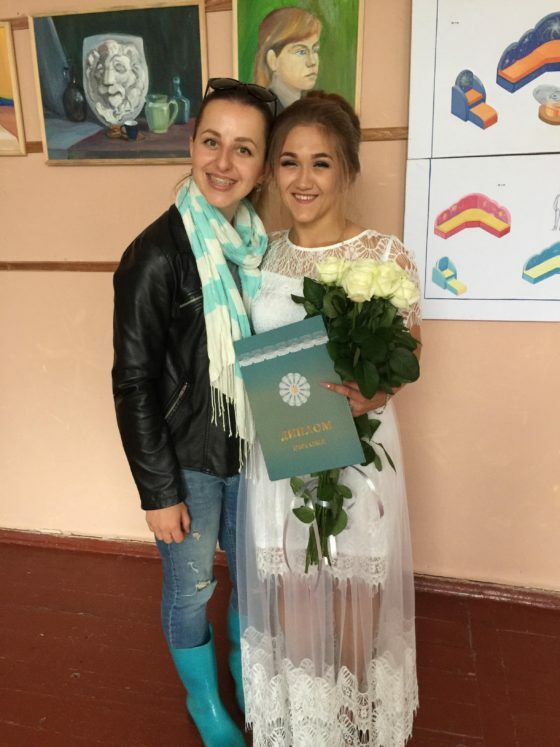 Katya and her brother were taken to an orphanage. 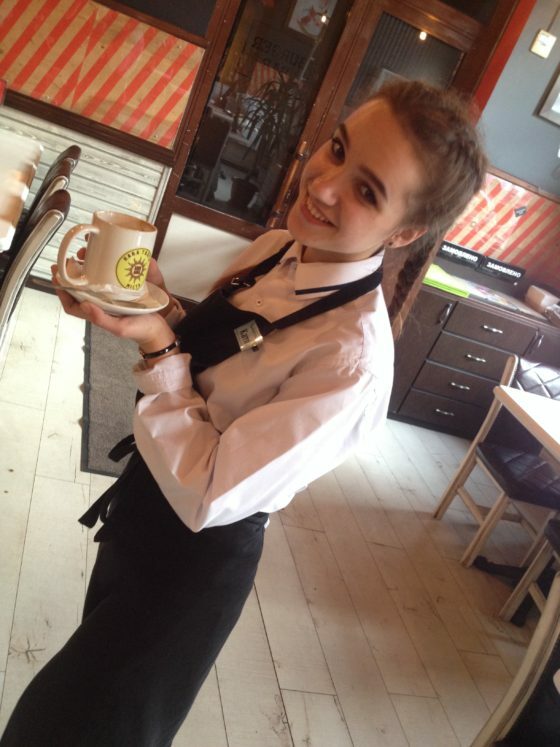 Katya at the cafe where she works. Her mother died of cirrhosis of the liver in 2016, at 38 years old. A desire appeared in my heart to help more. I told my friends about the Shelter. We had a youth service for the kids every Thursday. I understood that it was my calling to serve kids like this. I volunteered for one year, then started to work officially. I started a new program, Educational Outreach. I’ve been working for Last Bell for four years now. LB: Tell me about you personally…? Lena: I grew up with my mom. I graduated from university as a psychologist, then I studied at Christian Seminary to be a teacher of Christian Ethics. I’m a member of First Baptist in Zhytomyr. Before Last Bell I worked as the “right hand” of a pastor… I was the church administrator and the main assistant for his IT business. I’m a Sunday School teacher. My passion is teenagers… I understand them like no one else! 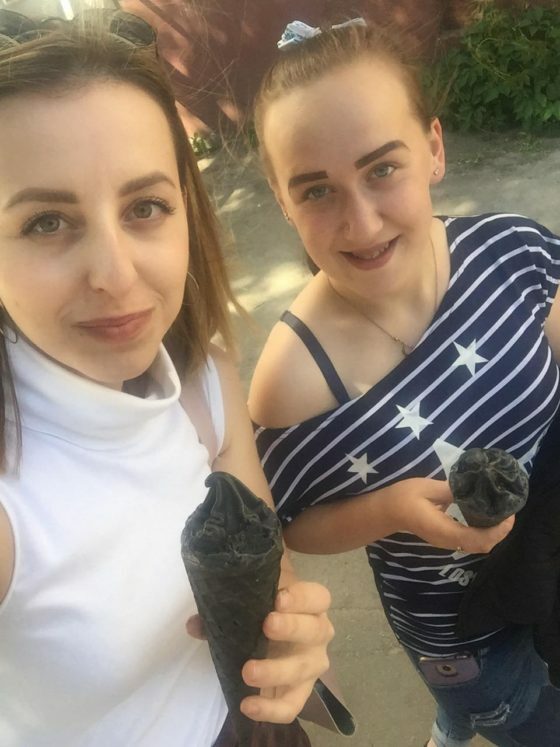 Lena and one of our youth with a treat of black ice cream, very trendy even in Ukraine! LB: What special skills or abilities do you bring to your work? What would other staff members say? Lena: I’m the youngest actually, so I bring fresh ideas to the organization and… [Lena and Yulia look up a word on a phone] …youthfulness. 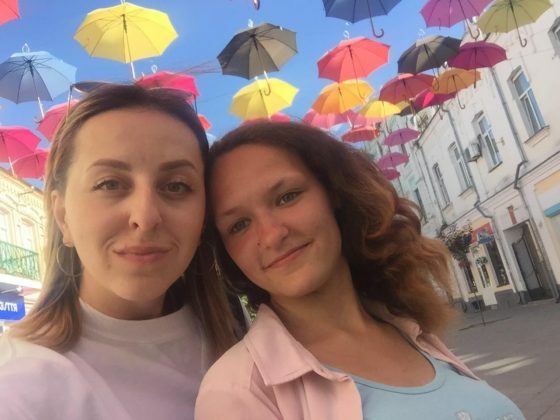 Yulia: I’ll add: Lena helps a lot with camps and creative ideas… Every month we have a youth meeting for Educational Outreach. She brought fresh ideas. 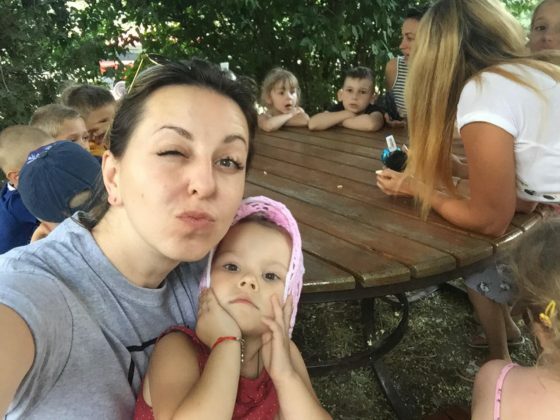 Lena: Every day is different… I start my day with a prayer for the kids’ difficulties and problems. Usually I prepare a list. Maybe there’s a meeting for staff members… If it’s my “duty day” at Day Center, I talk with the kids every hour, every minute. If they have medical problems, I go with them to the doctor. It takes a lot of time sending messages to organize a new meeting or camp. Every night I write a list of things I couldn’t get done. 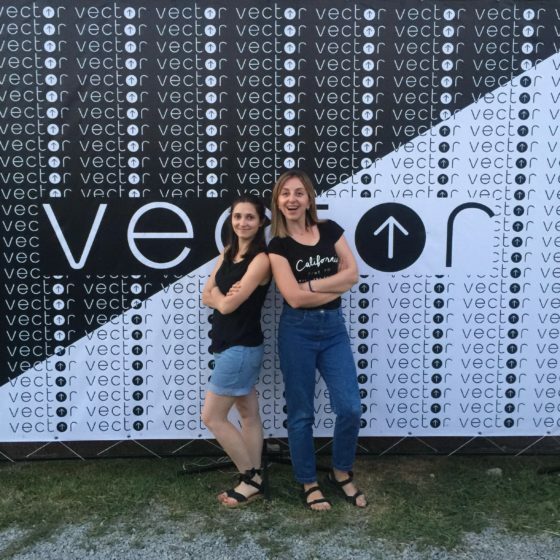 Lena at Vector youth group with Sveta, an orphanage graduate who’s become a trusted volunteer. Lena treats these young women not as clients, but as friends. LB: Do you feel a call from God to work with orphans? How is this part of God’s Kingdom and purposes? Lena: It was not by accident that I’m here. It came about in an amazing way. And when I’m reading the Bible, I read that God is the Father of orphans. I always wanted to be His hands and feet for these people, that God could use me for His kingdom. In different situations, when I prayed to Him, He answered, “Yes, this is your place.” I received lots of offers of different jobs, but I always understood it was my place to be here. Lena: This is the main thing, to have relationships. It helps [our youth] come to God. It helps us to understand their needs. If there were only programs and activities, we would never know their needs, their real needs. LB: Can you tell me a story about a time when having a relationship with a young person made it possible to serve them in some other practical way? We’re thankful for Lena’s energy and boundless compassion!